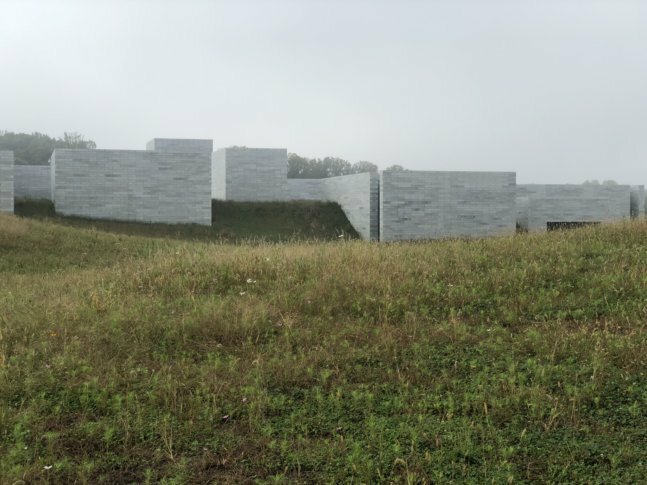 Glenstone, a museum in Potomac, Maryland, reopened on Oct. 4 with a new 200,000-square-foot building to showcase modern and contemporary art from its collection. Here's a quick tour of the highly anticipated addition. See video and photos. Video edited and produced by Ginger Whitaker. WASHINGTON — The D.C. area is home to several museums — some are national landmarks that house rocket ships, others are intimate estates that showcase royal jewels. Now, there’s a new one to add to the mix — well, sort of. In 2006, Glenstone opened its 30,000-square-foot gallery just 15 miles outside the nation’s capital in Potomac, Maryland. And on Oct. 4, after five years of construction, the museum introduced its new expansion to the public — a 204,000-square-foot building, called the Pavilions. Designed by architect Thomas Phifer, the building encompasses an 18,000-square-foot water court and houses 11 different gallery rooms, filled with modern and contemporary art from Glenstone’s collection. Surrounding the Pavilions is 230 acres of meadow, peppered with wildflowers, walking paths and outdoor sculptures, including the 37-foot-tall “Split-Rocker” from Jeff Koons. Twenty-four thousand flowers decorate the half-pony, half-dinosaur steel frame. “And the idea is to just sort of disconnect and let yourself get ready to experience the landscape as well as the art and the architecture,” said Laura Linton, chief administrative officer at Glenstone. A seven-minute walk from the parking grove to the Pavilions allows for physical, and mental, distance between the modern art and demands from the modern world. The slightly sloped gravel path aids in the dramatic reveal of the new stacked-concrete structure. “The building slowly reveals itself. When you first cross the bridge, you don’t even know where the building is, and so the path takes you up there,” Linton added. Visitors can expect to see works from renowned names such as Rothko and Pollock; a new farm-to-table cafe and an arrival hall/bookstore are also part of the $200 million expansion. The museum, which doesn’t charge admission, limits the number of visitors to 400 each day so that those who come are free to wander the galleries and the grounds without feeling rushed. “We want people to come in and spend as much time as they want and feel like the place belongs to them. It encourages this slow art movement where you have as much time as you want with a piece,” Linton said. Reservations can be made online three months in advance. All times are currently booked through the month of December, but Linton said don’t get discouraged. Cancellations pop up, plus, the museum isn’t going anywhere. WTOP’s Ginger Whitaker contributed to this report.